Blue, green, yellow, orange and white Lego pieces were stacked in varying heights representing different fractions. At a nearby table, Little Bits were used to turn wheels and make lights go on and off demonstrating simple circuits. 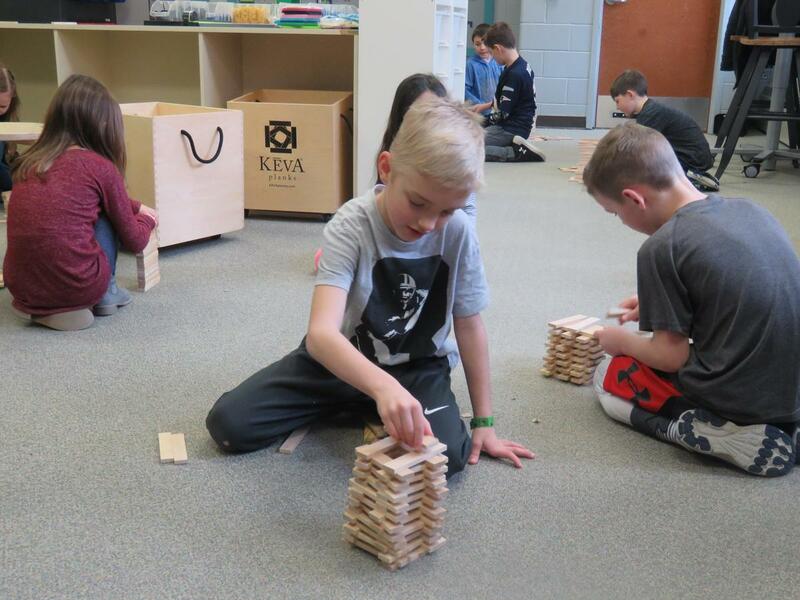 And later, students used their ingenuity and creativity as they tried to build the tallest tower possible using 100 Keva Planks. 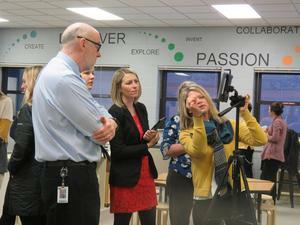 Lee Elementary School's Makerspace room was in the spotlight and guests from East Grand Rapids Schools were impressed. East Grand Rapids administrators said they are considering creating their own Makerspace room but wanted to visit schools to see how the room functions and what works best. Makerspace meets many needs of the STEAM (Science, Technology, Engineering, Arts and Math) learning process that has gained ground in public schools. Lee's Makerspace allows students to tear things apart in the deconstruction zone and understand how things work. They Skype with students around the world, make videos and turn their ideas into 3-D models with a 3-D printer. They follow Lego instructions to create something found on a farm or use Legos to work on math problems. They create items out of cardboard. There are crayons and markers and all kinds of scrap papers and materials to build, design and simply let their imaginations soar. Lee Elementary's Makerspace was created in 2017 using space once occupied by a now outdated computer lab. Since then, it's been a place of hands-on learning, experiments and creativity. The space was renovated through grants, fundraising and many donations from the community. Lee Principal Angela Jefferson said it's a wonderful place for students to get their hands on blocks and Legos and dive into creativity and thinking outside the box. 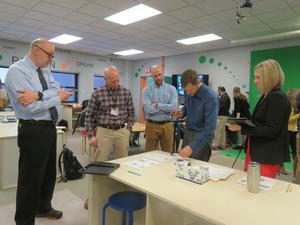 "We love our Makerspace room and what it can do for our students," she said. "Our teachers continue to find ways to incorporate lessons with hands-on learning in Makerspace." East Grand Rapids Wealthy Elementary School Principal Carlye Allen was intrigued by the Lego math demonstration. "This Lego math lesson is so visual. I can see it being very helpful for our students," she said. 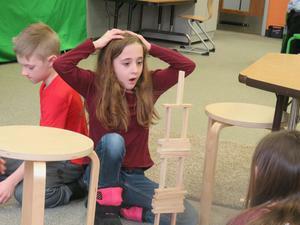 Third-grade teacher Josh Thaler said using the Legos for many different math lessons is much easier for some students. "They can see the fractions or the addition and subtraction," he said. Lee combined the guest visit with a professional development hour for Lee teachers to receive a refresher course on how the Makerspace can enhance the classroom curriculum. Second-grade teacher Nathan Fischer demonstrated the Little Bits where circuits turned on lights for a quiz board on a shadow box. Nearby, a stop animation demonstration by TK Technology Director John Dombrowski showed how student writing comes to life in film. Students simply prepare their stories, then create their backgrounds and characters. Using stop animation they can then film their story scenes and record their voice-overs to bring them to life. The green screen was another area where TK Tech Director Angie Ruger showed how to incorporate video production with writing assignments, social studies, and science. 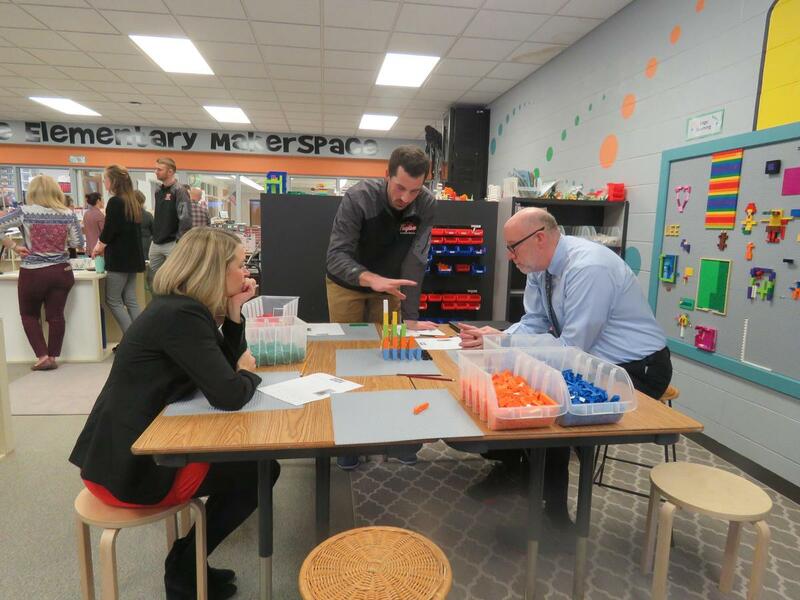 After the nearly one-hour teacher training, the East Grand Rapids visitors stayed to watch Fischer's students actively engaged in the Makerspace area. Students grouped Keva Planks in different combinations to easily count out 100 planks. Some made piles of 10 while others made piles of 5 and some came up with other methods. Then students were challenged to use their creativity and engineering skills to build the tallest structure they could using all 100 planks. A second task asked them to work with a partner to create two structures connected by a bridge. Students with the Kava Plans were spread out all around the room - on the tables and the floor with plenty of room for students to walk around and see what others had done. Fischer said he uses the room with his students often. "They love it," he said. "They would come in here every day if they could. 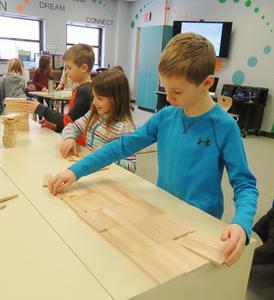 It's just a great place for them to be creative and have hands-on learning."